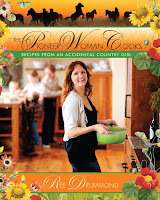 Well, the odds for winning a book in this last giveaway of The Pioneer Woman Cooks were pretty high this time around. But, I won't dawdle and will just announce the winners. Send your contact information to me and I'll forward it to Ree. She'll be sending you the books! So, then I was close right? I can tell. I really almost won. Congratulations to the real winners. YAY! Thanks! I sent an email with my address this morning. Seattle Premiere - pick my dress! No Impact Man book winner!